The gentle fluting shape of this classic vase is sure to compliment any bouquet. Handmade in the USA. Dimensions: Height 9 1/2"; Across top of Vase at its widest: 6 1/2"; Across top of Vase at shortest: 3"; Base: 3 1/4". 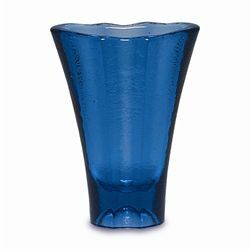 We have 1 cobalt aurora vase in stock.